Looking to God's Grace for a real sense of assurance. Despite our professions of belief, our baptisms, and our membership in the church, many of us secretly wonder, Am I truly saved? We worry that our love for Jesus isn't fervent enough (or isn't as fervent as someone else's). We worry that our faith isn't strong enough. We struggle through the continuing presence of sin in our lives. All this steals the joy of our salvation and can lead us into a life characterized by legalism, perfectionism, and works righteousness-the very life Jesus freed us from at the cross! But Greg Gilbert has a message for the anxious believer-be assured. Assured that your salvation experience was real. Assured that your sins-past, present, and future-are forgiven. Assured that everyone stumbles. Assured that Jesus is not your judge but your advocate. With deep compassion, Gilbert encourages you to release your guilt, shame, and anxiety to rejoice in and follow the One who set you free. 8. What about Besetting Sins? 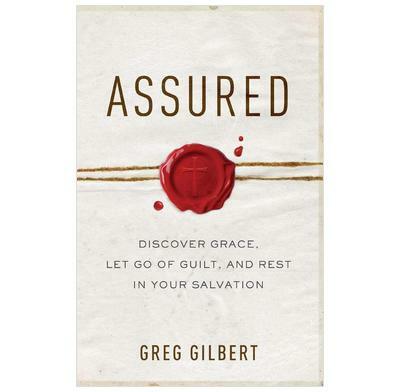 In this brilliant new book, Greg Gilbert cuts through the fog of confusion surrounding our questions--and fears--related to assurance. Bristling with cinematic imagery and clear-eyed biblical reflection, Assured will reanchor you on Christ, the solid rock. All other ground is sinking sand. That fact that Christians are assured of salvation is one of the greatest truths of God's Word, one of the most cherished affirmations of the Reformation, and one of the central pillars of the faithful Christian life. In this timely book, Greg Gilbert, a tremendously gifted and faithful pastor-theologian, presents a powerful case for assurance with deep biblical and pastoral insight.